Last I checked, GetEncoderInfo is in System.Drawing.Imaging. What is the problem here? Edit: I do have System.Drawing referenced. Last edited by Llam4; 04-08-2007 at 08:01 PM. GetEncoderInfo is a method call. 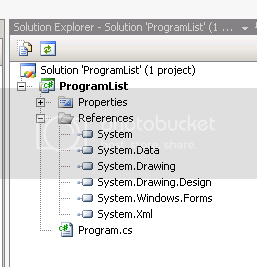 System.Drawing.Imaging is a namespace. A namespace doesn't contain methods, only classes contain methods. You are missing a classname. Okay. Do you know which class GetEncoderInfo is in? Been over google and all codes are using it the same way I am. I know I've referenced everything I need to. Last edited by Llam4; 04-08-2007 at 07:54 PM. Finished an alpha version. The quality is poor because I can't use GetEncoderInfo(), but it works great. It updates every 15 seconds with all of the programs of interest I'm running. I think you could use ImageCodecInfo.GetImageEncoders() and search the array for the encoder you're looking for. ->          WholeImage.Save(@"C:/Program Files/Apache Software Foundation/Apache2.2/htdocs/Processes.jpg", jpegCodec, Params); // Problem code. Enter GetEncoderInfo in Google and click the first MSDN link that pops up. The example on that page uses a custom method called GetEncoderInfo to do exactly what you need. How to check a directory is exist or not?